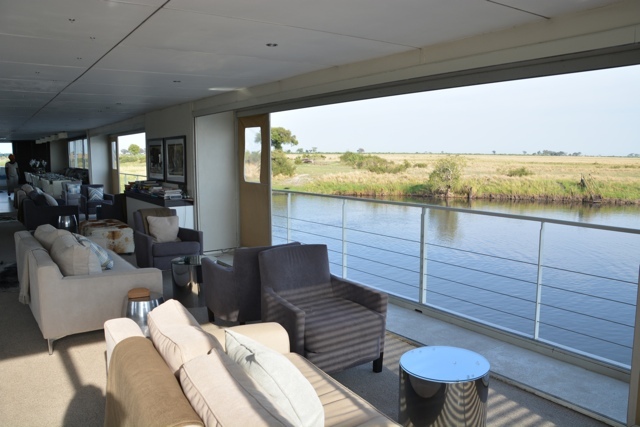 Those two words together got me really excited when I first heard about the Zambezi Queen Luxury Houseboat in Southern Africa on the Chobe River between Botswana and Namibia. For a long time I had dreamed about visiting South Africa and its nearby countries as I dreamed of going on safari, seeing Victoria Falls, meeting the people, seeing how the locals lived in the cities and villages, trying the food and so much more. 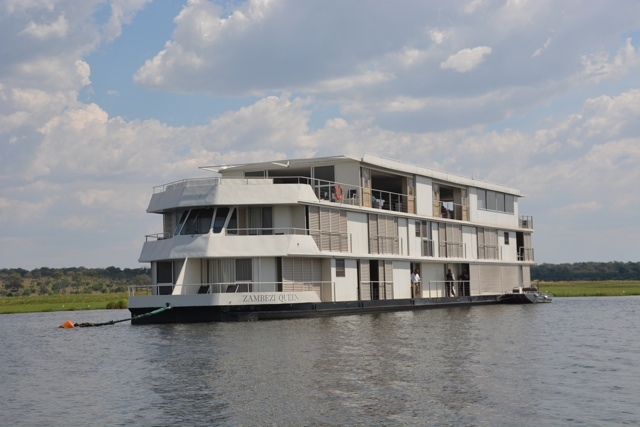 Learning about the Zambezi Queen just added another item to experience onto my bucket list. While planning my second trip to South Africa I was happily able to also fit into my schedule a visit to a few other parts of Southern Africa. I was also able to see Botswana, Namibia, Zimbabwe and Zambia. 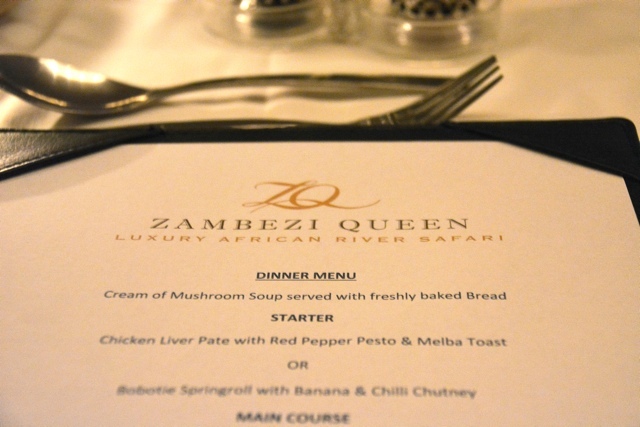 First up was the Zambezi Queen in Botswana and Namibia. The fastest and easiest way to get to the Zambezi Queen was by flying. I booked a quick flight from Johannesburg to Botswana’s Kasane airport with South African Airways Airlink service where I would land as close as possible to the Chobe River where I could board the ship. Also from there I was able to arrange transfers with a company called Wild Horizons to take me to Zimbabwe to Livingston near Victoria Falls after my boat trip. 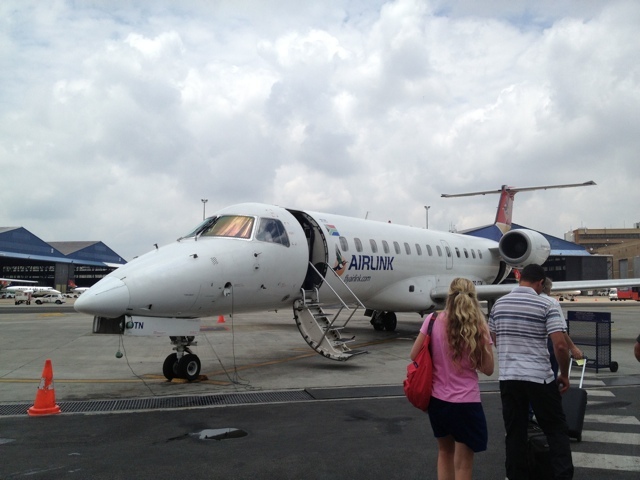 The tiny Arilink airplane I flew in from Johannesburg to Kasane, Botswana. Upon landing at Kasane I had transfers arranged to take me to the Chobe river where I then got stamped out of Botswana (which 15 minutes before I had just been stamped into) and I hopped onto a small boat and was taken to an island in the river that is part of Namibia and was stamped into the country before being taken down the river to the Zambezi Queen. So just a note – if you are planning on going on the Zambezi Queen make sure you have a few extra pages in your passports for all of the stamps you will quickly acquire. As I arrived at the houseboat I was greeted by the captain and the staff singing me a welcome song along with a refreshing towel and welcome drink. I was shown my room, a master suite at the front of the boat on the bottom level and it was one of those experiences where you just say “Ohh and ahh” about everything you see. I settled in, we were giving a safety briefing and then I mingled with the rest of my ship mates, a family of 13 from the US, a pair of Irish ladies traveling together and two couples who were South African. Everyone mixed together quite well and the nice thing about the size of the boat was that we could easily also get away from one another for some piece and quiet. For the afternoon the houseboat cruised down the river and I spotted some of my first animals from the boat. It was an unreal experience sitting a comfy couch with a drink in hand watching elephants, buffalo, vultures, fish eagles, hippos, and crocodiles just going about their daily routine as we quietly floated by them. Previous to this I was use to viewing these animals in a bumpy safari vehicle, on bench seats, sans drink in hand. This experience was beyond luxury. Possibly “Ultimate Luxury”? 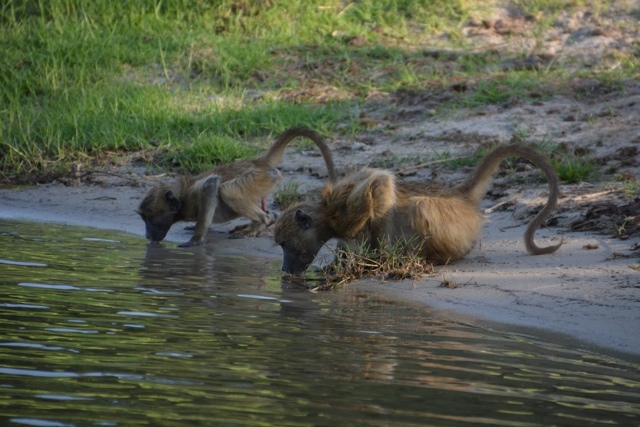 To see more of the animals I saw while cruising down the Chobe River check out my video HERE. A comfy place to relax and watch nature float by. 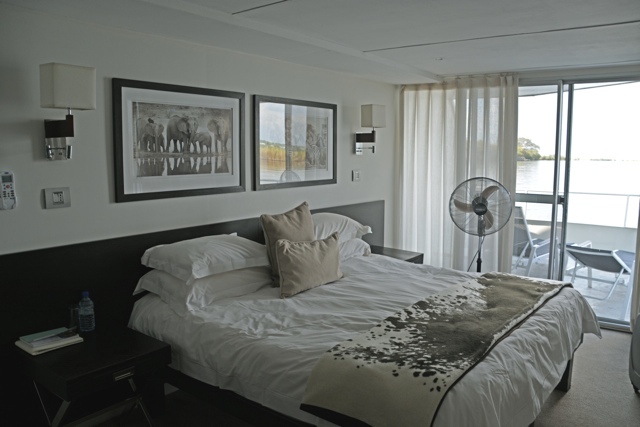 I was unfortunately only aboard the Zambezi Queen for two nights, I would of probably liked to stay a week or longer. Perhaps just move in. 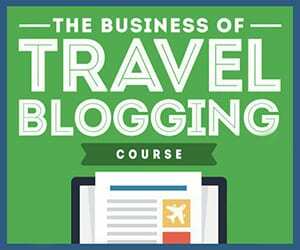 However they currently only offer 2 and 3 night stays, which you might be able to arrange to stay longer. Also the cell and wifi service being in the middle of nowhere wasn’t the greatest. AKA I only got logged on for a few minutes. But honestly its nice to not be connected when you are in such a beautiful place. During my stay we were served three meals a day in the dining area. The bar that was open the majority of the day also provided a few snacks for in-between meals if needed and there was coffee and tea available around the clock. They also provide drinks and snacks on the excursions that you can opt in for. Note: The majority of alcoholic drinks were not included in the booking cost and were extra, however you are also allowed to bring your own alcohol onboard with you. The activities available to us were going on water or land safaris (for the land safari you have to enter into Botswana again so you get about 4 more passport stamps going in and out of Botswana and Namibia). 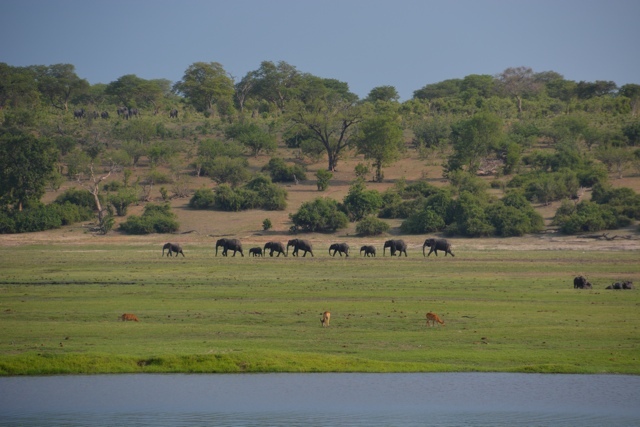 The land safaris took place in the Chobe National Park home to over 70,000 elephants and tons of other animals including the Big Five. 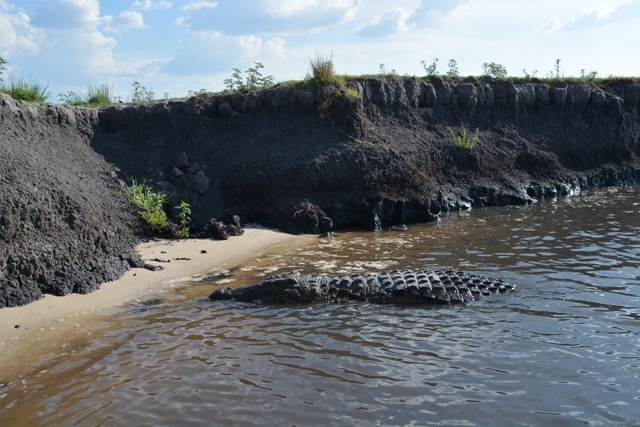 I however chose the water safari as it was a different experience than I had had before and you were able to get much closer to the animals by the waters edge and in the water of course. 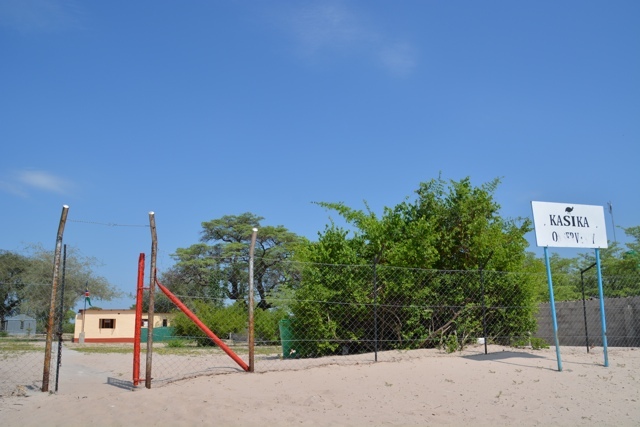 There was also the options of going fishing, visiting a local Namibian village, and even going to a local pub. I visited the small Namibian village where we were given a tour and some of the villagers and kids sang and danced for us. We learned that they live off of the land and most of the men are fisherman. They don’t need much money to survive or get by but the majority of the money they do make is from tourists like myself who come and visit and purchase hand carved animals and jewellery and other things that they make in the village. A gorgeous Baobab tree in the boma of the Namibian village that we visited. Apparently the grandfather chief of the village was buried here along with his belongings and possessions and he had a baobab seed amongst his clothes. 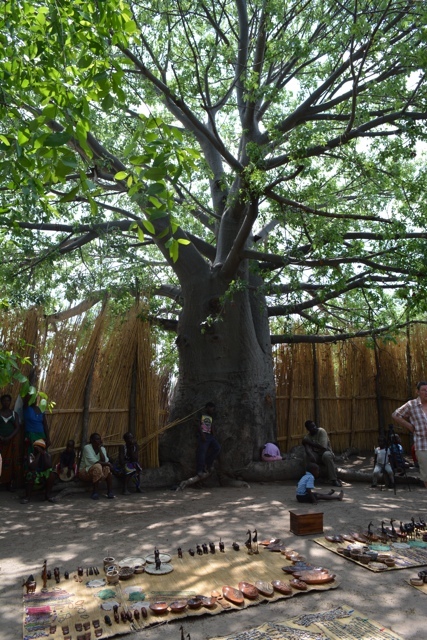 This gorgeous tree grew up from it and it has been now made the centre gathering area of the village. One of our guides on the Zambezi Queen was even from this village so it was really cool to see and meet the people and his family. Aboard the boat the staff were very friendly and helpful and our captain was always close by to answer any questions we might have. The level of service was high, everything was impeccably clean and anything that you could of asked for they provided for you. Special thanks to the Zambezi Queen for hosting me during my stay. As always all opinions and views expressed are my own.